Departing from the Antique Boat Museum in Clayton, NY on the morning of December 3, the 64 year old John Hacker designed “world’s largest runabout” Pardon Me embarked on a 500-mile voyage on a tractor-trailer and arrived at Brooklin Boat Yard where it will receive a comprehensive makeover. Everything from the woodwork to the engine and transmission will be restored to original condition and, in some aspects, better than when it first hit the water in 1948. 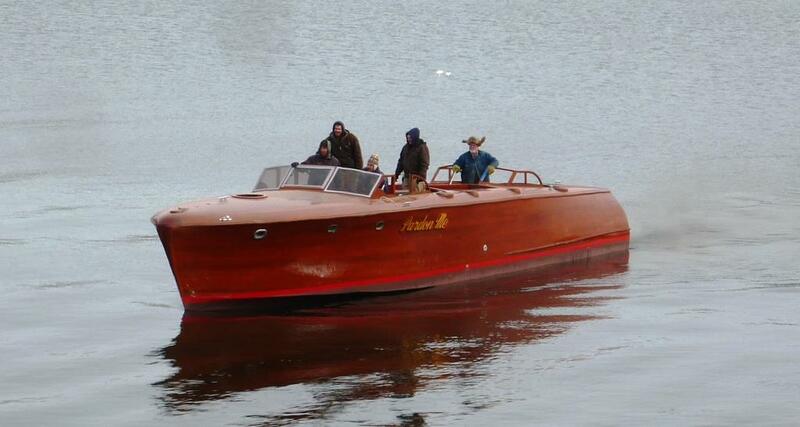 Once the work is complete, the sleek mahogany beauty will return home to the Thousand Islands and be highlighted at the 50th annual Antique Boat Show in August 2014. “It was too big a project for us,” museum Executive Director Frederick H. “Fritz” Hager said as the 16-ton, 48-foot-long runabout was hanging from a crane to be placed carefully onto a trailer bed Monday morning. Initially, the Antique Boat Museum started restoration of the vintage boat with its own crew, but soon realized the work would take too long and take away too much manpower from other projects. 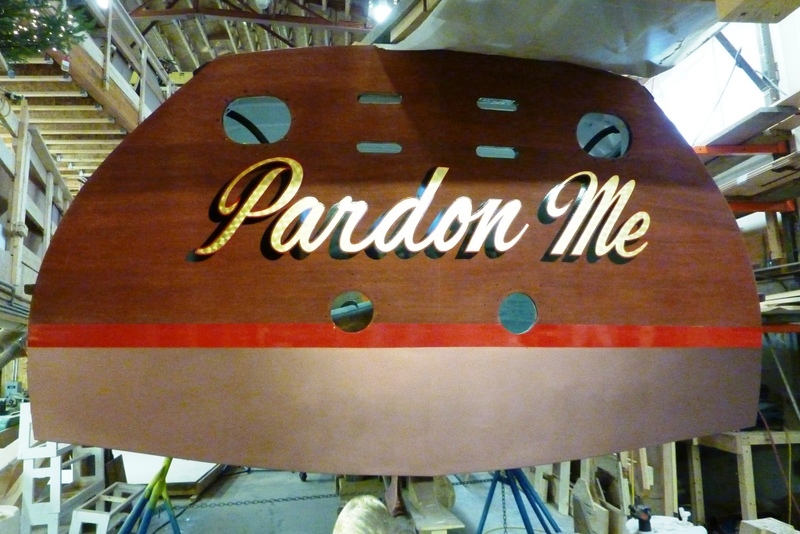 Of the four quotes the museum received for Pardon Me’s extensive restoration, Brooklin Boat Yard was determined most capable for the job. The work will not begin until June of 2013 because of on-going new boat construction and restoration projects already underway but then work will begin in earnest. 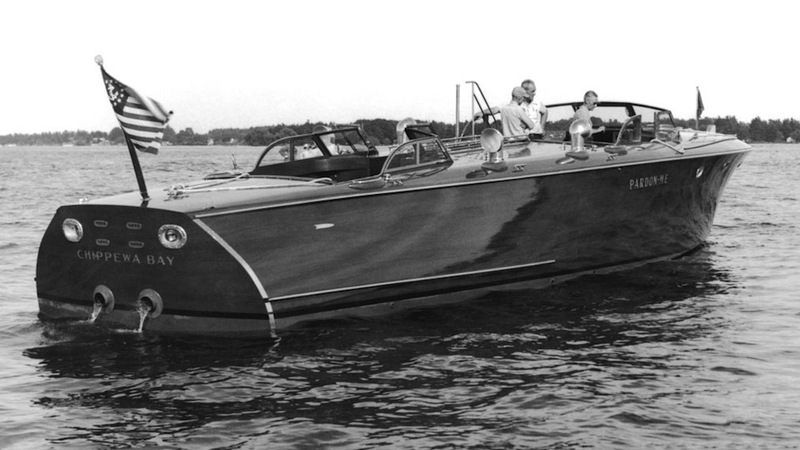 Originally commissioned by the late Charles Lyon, an avid boater of Chippewa Bay, NY along the St. Lawrence River, the ever-so-elegant Pardon Me was custom designed by John L. Hacker, who has been dubbed one of the greatest American boat designers of the 20th century and construction was carried out by the Hutchinson Bay Boatworks of Alexandria Bay, NY. From afar, the double-cockpit runabout looks like a rather typical classic streamlined styled watercraft, which normally range from 20 feet to 36 feet in length. But up close, this “super-sized” (LOA: 48’) speedboat easily dwarfs the largest school bus allowed under federal law. Propelling Pardon Meacross the water at upwards of 60 mph is a Packard 4M-2500 engine, a supercharged 12-cylinder engine that originally was developed for patrol torpedo boats during World War II. “That’s what’s impressive about Pardon Me” said Fritz Hager “She’s big and loud and really goes fast”. Because her massive engine provides so much power making the boat difficult to handle in close quarters, the original owner, Mr. Lyon, ended up selling Pardon Me in 1950. Its second owner, Richard Locke, a Michigan industrialist, renamed it Lockpat II and kept it for more than two decades until he finally sold it in 1976 to a longtime admirer of the boat, Nicholas Beck. James P. and Lorraine E. “Tony” Lewis, formerly of Beaver Falls, NY who were among the founders of the Antique Boat Museum, later purchased it in Florida and donated it to the museum in 1986. Pardon Mewas last operational in 2005 but was in the water for display until 2008 after which she was in the workshops of the Antique Boat Museum and now here at Brooklin Boat Yard. For those interested in learning more about Pardon Me visit the excellent website of the Antique Boat Museum www.abm.org which along with a lot of other very interesting classic boating information devotes several pages to the life and history of Pardon Me.